The refugee crisis has highlighted some of the issues facing cities in integrating diverse groups and populations. Far right groups try to sow discord by emphasising the negative impact of increasing population numbers on public services and exploit fears of “new” and different cultures “swamping” native cultures. But cities have always been places where diverse ethnic and social groups come together and while these processes are not without their logistical problems, there are plenty of examples of good practice in promoting social cohesion. Immigrant and refugee communities can be both successfully integrated but also add their knowledge and unique experiences to cities. Here we highlight and celebrate some of these positive aspects, which occur in many of Glasgow’s Community Gardens. In addition to growing, community gardens tend to offer a wide range of non-gardening related activities to their users and the communities within which the gardens are situated. This includes, amongst other things, community kitchens, local heritage-related events and craft classes. A wide diversity of groups and people are involved in community gardening activities, such as, neighbourhood community groups, third sector organisations, NHS bodies, disability groups and refugee and asylum initiatives. Community gardening has emerged as a notable social phenomenon in North America and Europe, especially in post-industrial urban centres where derelict city spaces can be brought back into useful forms of community activity (Eizenberg, 2012). As a city with a long history of deindustrialisation and urban deprivation, Glasgow has one of the highest levels of derelict land in the UK. Over 60% of Glasgow’s population lives within 500 metres of such a site, and 90% within a kilometre (Scottish Vacant and Derelict Land Survey, 2013). Derelict sites tend to be disproportionately concentrated in those parts of the city with the greatest incidence of multiple deprivation, including; lower life expectancies and high rates of morbidity. 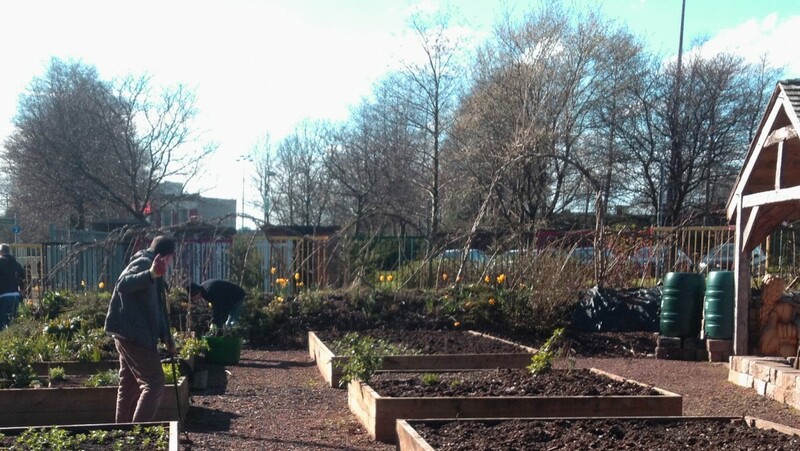 Community gardens have been established throughout the city with the help of small NGO’s such as Urban Roots (http://www.urbanroots.org.uk/) and the North Glasgow Community Food Initiative (http://www.ngcfi.org.uk/). These groups tend to be committed to spreading the benefits of community gardening, such as improving diet, and establishing training and educational opportunities. In Glasgow, there is an incredible diversity to those participating in community gardening across the city. In one site in the east end, for example, volunteers ranged from professionals, to the homeless, to those with learning and physical disabilities. The local school and nursery were also involved. At another site in the south of the city, a participant noted that many volunteers were from minority black and ethnic groups, many seeking refuge and asylum from war and oppression. The multi-cultural mix of volunteers encouraged the development of relationships, and the exchange of knowledge and ideas. For example, one of the garden organisers highlighted educational interactions between volunteers and others about growing herbs and vegetables, and cooking. Such exchanges led to specific events, such as cooking evenings where minority black and ethnic groups could share knowledge of food and its place in their cultures. This provided otherwise marginalised groups with opportunities to enhance and enjoy public spaces in Glasgow (Crossan, et al, 2015b). Such cases demonstrate how community gardens can facilitate processes of relationship building, where volunteers and other individuals from diverse backgrounds meet and exchange ideas and stories, and participate in purposeful shared activities. This leads to the development of comprehension and understanding of others. Community gardens therefore afford individuals and groups a shared space where they can interact with other individuals and groups who they are unlikely to have any substantive contact with in other circumstances. In this way, derelict and underused land is being transformed into a valuable community asset forging new social connections in areas of urban blight. This stands in beautiful contrast to the regressive politics of the far right and the profit-first logic of aggressive capitalism. In other words, people of various social, cultural and ethnic backgrounds are working together to transform blighted spaces across the city into beautiful and productive places. Eizenberg, E. (2012) Actually Existing Commons: Three Moments of Space of Community Gardens in New York City. Antipode 44, 764-782.